Šentvid pri Planini (pronounced [sɛnˈtʋiːt pɾi plaˈniːni] or [sənˈtʋiːt pɾi plaˈniːni]) is a village east of Planina pri Sevnici in the Municipality of Šentjur in eastern Slovenia. The area is part of the historical Styria region. 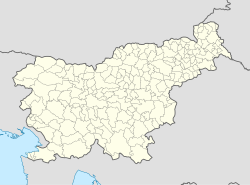 The municipality is now included in the Savinja Statistical Region. The name of the settlement was changed from Sveti Vid pri Planini (literally, 'Saint Vitus near Planina') to Šentvid pri Planini in 1955. The name was changed on the basis of the 1948 Law on Names of Settlements and Designations of Squares, Streets, and Buildings as part of efforts by Slovenia's postwar communist government to remove religious elements from toponyms. There are two churches in the settlement. The parish church from which the settlement gets its name is dedicated to Saint Vitus (Slovene: sveti Vid) and belongs to the Roman Catholic Diocese of Celje. It is a 15th-century building with 17th-century additions. A second church, to the west of the settlement core, is dedicated to the Holy Cross. It is a 15th-century building much modified in the 18th century. This page was last edited on 20 March 2017, at 08:05 (UTC).